Paranormaly Yours: 12 Days of Kim ~ Day 5!! Today's featured Author is Emily Krat, YIPPY!! Thunder Storm had me gaga over Miles the moment he entered the book! I had never read books one or two before, but that's ok! Cause the series is not a continual story of one person, so it will stand on it's own two legs!! In Thunder Storm the story is about Jeni Jenkins, an Advertising Executive in New York. After losing her mother suddenly, she alone is responsible now for her grandmother, Elizabeth, who has Alzheimer's. Being a young workaholic, she has little time to care for her grandmother, so after talking to her best friend, Jordan, in Colorado, they come to the terrific idea to move Elizabeth in with Jordan at her B&B in the mountains of Colorado. Perfect right? When Jeni arrives in Colorado, immediate sparks fly between her and a local construction dude named Milo. Milo is this super sweet, hunky, manly man that is really into Jeni but makes it very clear to her he is unavailable and will not tell her why. Jeni continues to push the envelope with Milo and finally gets him to the breaking point and they fall into bed, bow chick a wow wow!! The most memorable part of the entire book was when Jeni FINALLY finds out the super secret of what's behind door #1 with Milo! Good Lord! I was like, WHAT??!! Yeah, this book was a gold mine, and it has much more to the story that just draws you in, totally loved it! 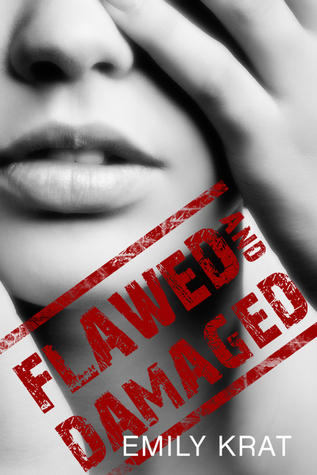 Join me on Facebook, and share your favorite book moment of 2014 to enter to win Flawed and Damaged by Emily Krat!